In this paper we discuss the problem of finding edge-disjoint paths in a planar, undirected graph such that each path connects two specified vertices on the boundary of the graph. We will focus on the “classical” case where an instance additionally fulfills the so-calledevenness-condition. The fastest algorithm for this problem known from the literature requiresO (n 5/3(loglogn)1/3) time, wheren denotes the number of vertices. 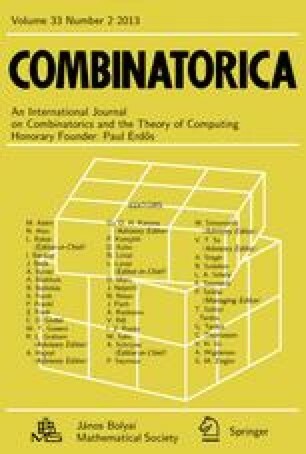 In this paper now, we introduce a new approach to this problem, which results in anO(n) algorithm. The proof of correctness immediately yields an alternative proof of the Theorem of Okamura and Seymour, which states a necessary and sufficient condition for solvability.